Cooking Planit T-fal Giveaway Finale! How would you like to have this gorgeous set of T-fal Stainless Steel with Thermo-spot 12-Piece Cookware delivered to your front door? Well, friends, today is the very last day to enter to win it! There have already been 48 bloggers (listed below) who have already given away this set of cookware, including myself. (My giveaway ended August 29th). The last two blogs will be choosing their winners tonight, so if you've been thinking about entering and just haven't gotten around to it, this is your last chance! You'll also want to head on over to Cooking Planit and have a look around. 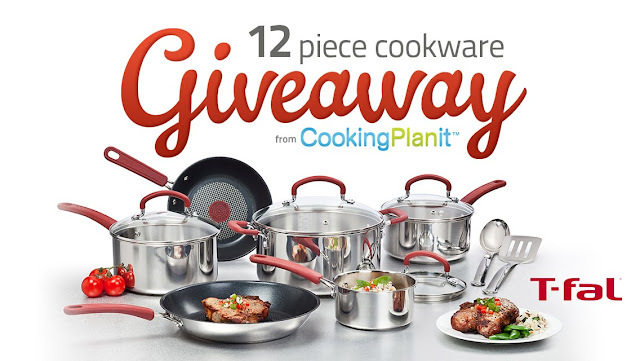 Cooking Planit has hosted this whirlwind of giveaways and registering for a Free Cooking Planit Account is a required method of entry to win the cookware. I have already registered for my Free Account and written a review of the website/app that you can find here. I highly recommend it. Chef Emily and the Cooking Planit team have a TON of amazing recipes that I know you'll love. You will not be disappointed! Drop by their website and check it out or download the app on your iPhone or iPad today! Now go get those last minute entries in! Good luck and congratulations to ALL of the winners! A big thank you to Cooking Planit, T-fal, and all the behind-the scenes folks (you know who you are ;) ) for inviting The Two Bite Club to participate in this super cool giveaway extravaganza. It has been a blast!